According to Bp. 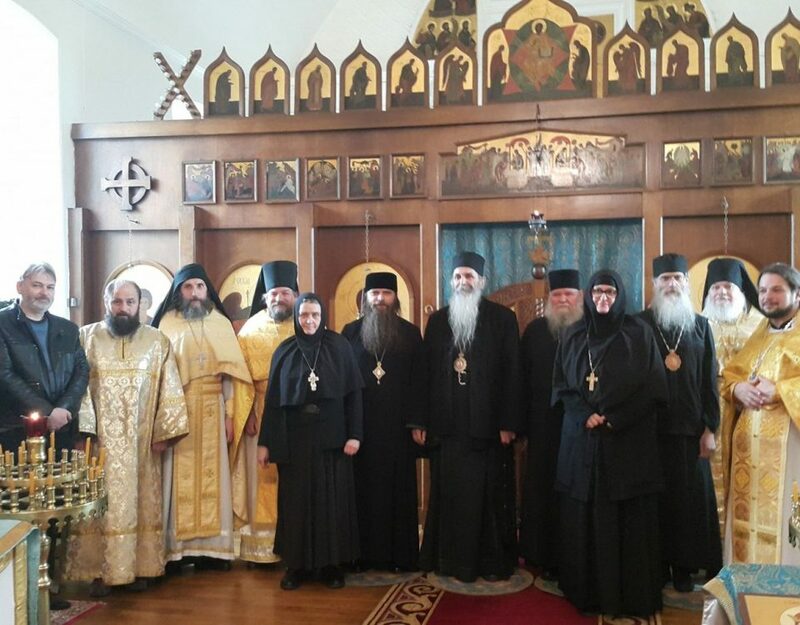 Stefan of Trenton’s official website Hegumen Andrei (Erastov) was consecrated a Bishop on this past Feast of Pentecost. Bp. Andrei was consecrated to be the Bishop of Yarraville and Ausralia, and was consecrated in Australia. This move reinforces the communion established earlier this year between Abp. Andronik and Bp. Stefan, with, of course, concelebrations taking place. Both Abp. Andronik, Abp. 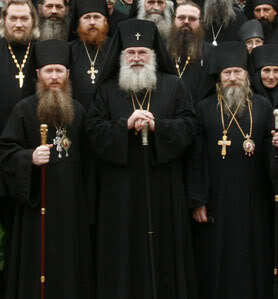 Sophrony (and a few others), still consider themselves to be Bishops of the Russian Church Abroad, and view Met. Agafangel to be the First Hierarch, but to being acting in uncanonical manners. Met. Agafangel, for his part, with his supporting Bishops, has stated that Abp. Andronik and others who go along with him are schismatics and heretics; particularly, they have made the charge that Abp. Andronik, Abp. 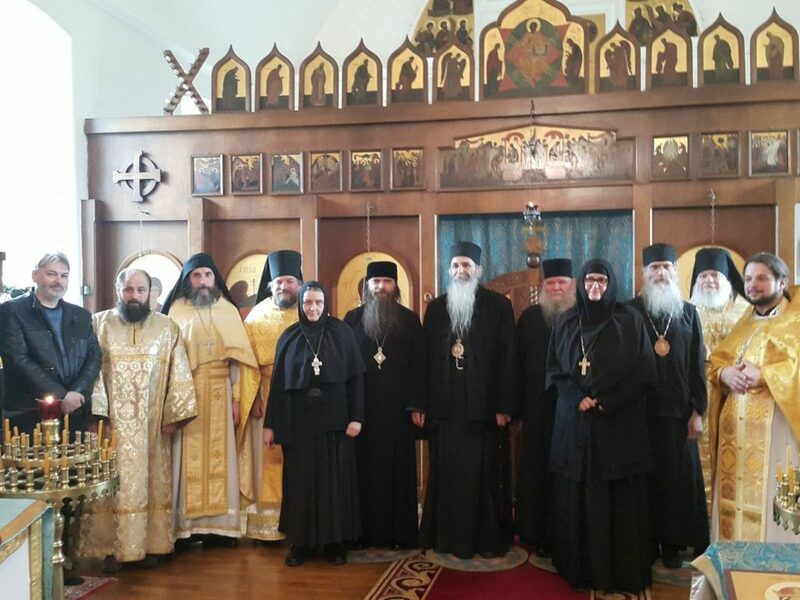 Sophrony, and others, are ‘ecumenists’ because they state that other True Orthodox jurisdictions which they are not in communion with may, in fact, be legitimate Orthodox Churches; whereas, Met. 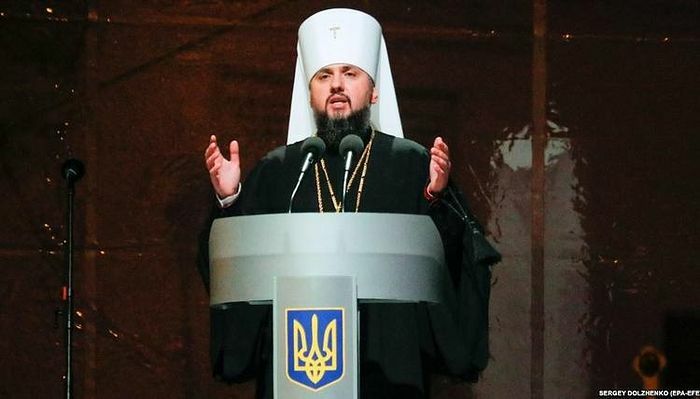 Agafangel and his supporters position is that it is heresy to state that any jurisdiction is Orthodox if communion is not held with them, particularly, that it is heretical to state that either all, or even some, of the ‘fragments’ of the anti-unionist ROCOR groups could be Orthodox if they do not submit to the jurisdiction of Met. Agafangel. 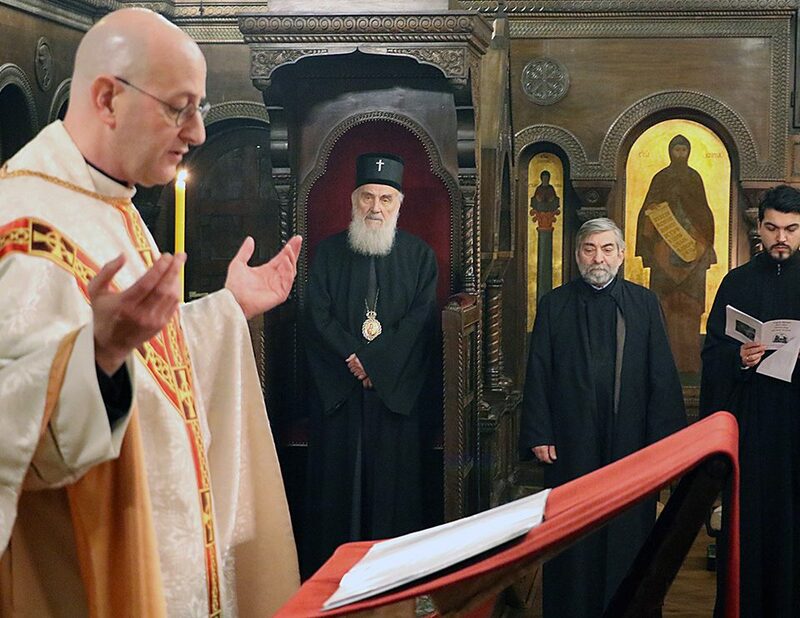 It is unclear, at this point, what, if any, position has been, or will be, taken in a defined public format by the Synods of the GOC-K and the Romanian True Orthodox Church. In accordance with this decree, on the Feast of Pentecost the consecration of Fr. Hegumen Andrei took place. On the eve of the Vigil, the order of Nomination was conducted, at which the decree of election was proclaimed, to which the nominee replied with the consent: “In so far that the Holy Council has judged me worthy of such service, with gratitude I accept and say nothing against this.” Then the bishops performed a short moleben to the Holy Spirit. The prayers ended with the dismissal of the day of Pentecost, after which the bishop-designate gave a homily expressing his thoughts in connection with the lofty service he was about to perform. On the next day, before the beginning of the Divine Liturgy, the order of the Confession of Faith was completed, during which the designate solemnly proclaimed the Orthodox Faith before the bishops, clergy and people, first by reading the Creed, and then in response to the command of Abp. Andronik, read the second confession detailing the doctrine of the Church about the properties of the three Hypostases of the Godhead and the incarnation of the Son of God and swore an oath to maintain unreservedly the Orthodox faith, and to keep the canons of the Apostles, the Holy Ecumenical Councils and the Holy Fathers. He spoke this oath, as well as the confession of faith, standing on the rug with an image of an eagle, which indicates that the bishop should be exalted above all in faith and virtue, rising in spirit to Heaven. After signing a special contract of confession and commitment, the designate handed it to Archbishop Andronik. Then Abp. Andronik awarded Reader Alexei Klestov from the Brisbane Parish of the Vladimir Icon of the Virgin the right to wear an orarion. 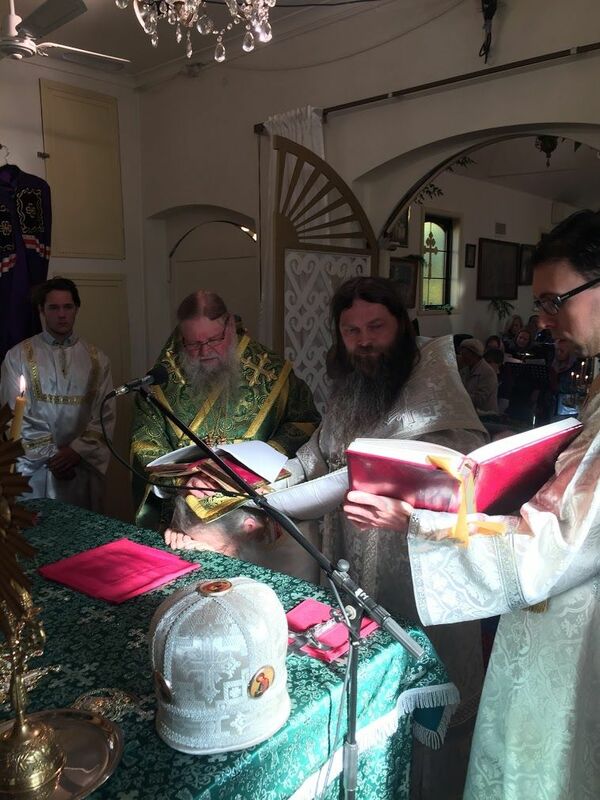 After the singing of Many Years, the Divine Liturgy began. The ordination of a bishop is performed immediately after the singing of the Trisagion, before the reading of the Apostle. Protodeacon Fr. Vasily Yakimov led the bishop-designate to the Royal Gates, where he was received by the hierarchs inside the altar. According to the Greek typikon, the bishops circled thrice around the Holy Table with the designate, singing the troparions, “The Holy Martyrs, who suffered well and were crowned,…”; “Glory to Thee, Christ God, the Apostles boast…” and “Isaiah, rejoice…” This ritual of processing the newly consecrated around the altar has a profound symbolic meaning. Exactly the same procession (around an analogion) and with the singing of the same holy hymn is found in the order of the marriage service. It also is part of the baptism service, and in all of these cases, it has the same meaning – a symbol of the close union with the Lord Jesus Christ, the symbol of the achievement of an indestructible union. The bishops placed the opened Gospel, like the hand of the Lord Himself, over the head of the consecrated kneeling before the altar. The presiding hierarch then exclaimed the prayer of the Mystery of Consecration. At the end of the service, Archbishop Andronik blessed the newly-consecrated Bishop to wear the episcopal mantle with the flowing ribbons. 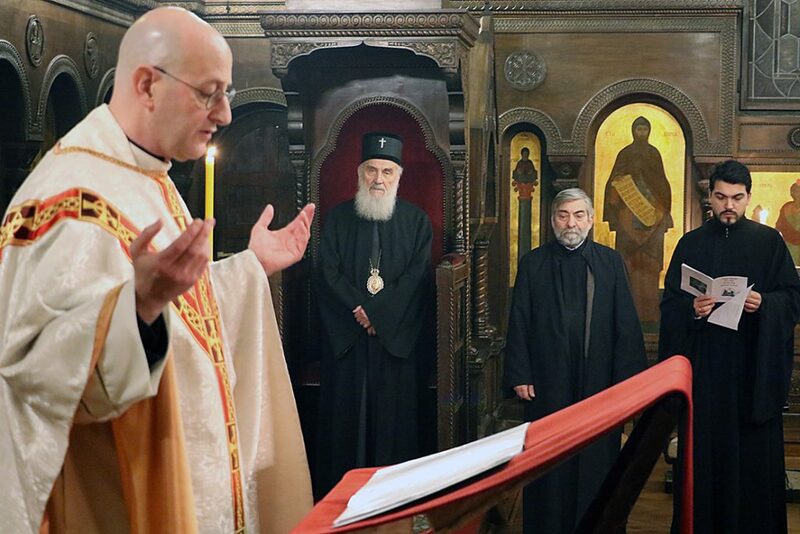 All the bishops then proceeded to the ambo where Archbishop Andronik, after giving the appropriate instruction, handed the newly consecrated Bishop Andrei a hierarchical staff. A both joyous and solemn atmosphere prevailed in the church, which was greatly enhanced by the beautiful and inspired singing of the parish choir under the direction of Director Victoria Sherba. At the end of the Liturgy, Archbishop Sofroniy delivered an instructive sermon that will be long-remembered. After the service, everyone was invited into the hall for a festive banquet. Through the efforts of the parishioners, under the guidance of their head sister Nadezhda Zakharova, beautifully decorated tables were bursting with abundant and delicious food. Special thanks to our dear Marisha Tereshkevich and her daughter Tamara for their selfless help. Undoubtedly, this memorable day of the Holy Trinity in 2017 will be remembered forever! Born in Moscow in 1960. Entered the Holy Trinity Seminary in Jordanville, NY, in 1979 and received a BA in 1982. Received his tonsure as a monk in 1985, and ordained a deacon in 1989. Made a hieromonk in 1993, he was a member of the brotherhood at the Holy Trinity Seminary from 1979 – 2006. From 2006 to 2009, he served at a parish in the south of France as a member of the Diocese of France of the TOC of Greece (under Archbishop Macarius). From 2009 to the present, Hegumen Andrei is the rector of the parish of the Holy Martyrs of Vilnius in Yarraville, Australia.